It is dry in Iowa. My apartment complex is somehow always 80 degrees, and I wake up not being able to swallow because every once of moisture has left my complex. I live next to my humidifier. 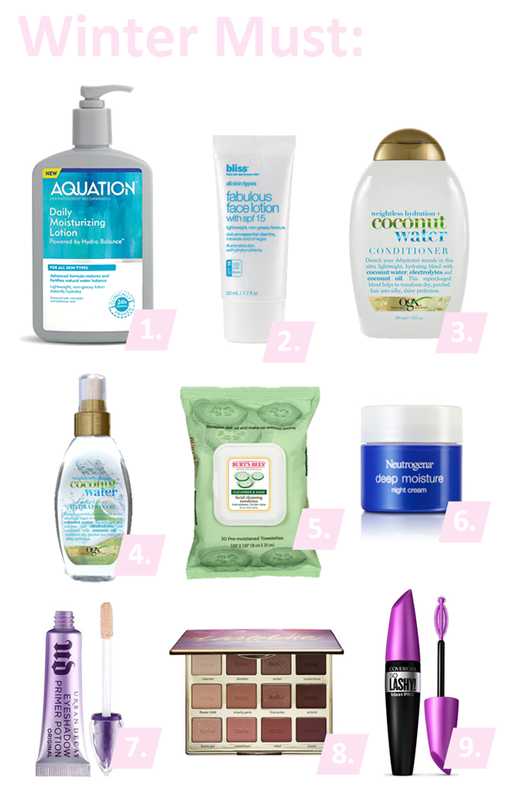 When I can't be standing right next to that, here are other products that help with the winter blues. Aquation lotion is amazing. I got this sent to me for free and it is probably one of my favorite lotions to date. It is pretty much like chugging a water bottle for your skin. The coconut water conditioner is the best smelling conditioner out there. For the makeup wipes, substitute that instead of washing your face to prevent striping it of your natural oils. Also, do not forget the night cream! My skin is a losing cause in the winter time. I mostly just focus on my eyes. These are my favorite go to products.